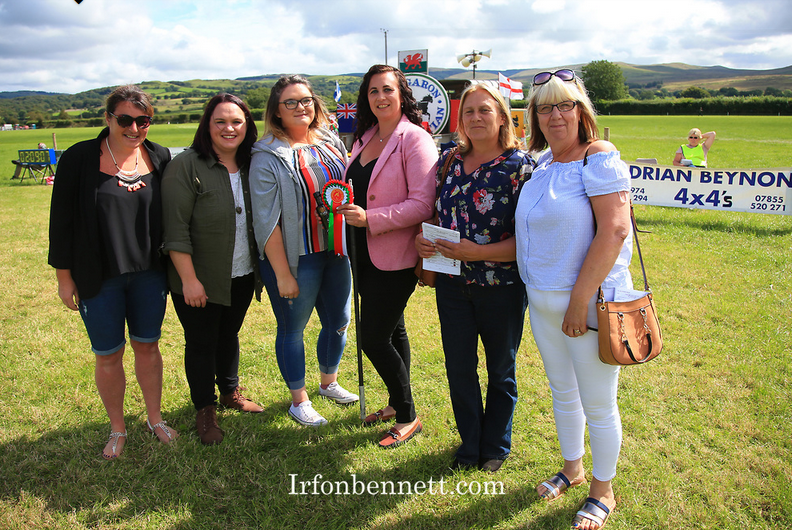 Now it would be unfair of me to claim that I knew that Michael O'Mahony would go on to have a blinder of a meeting at Tregaron, but I can say that it came as little surprise to me. The cream has a funny way of rising to the top, after all. 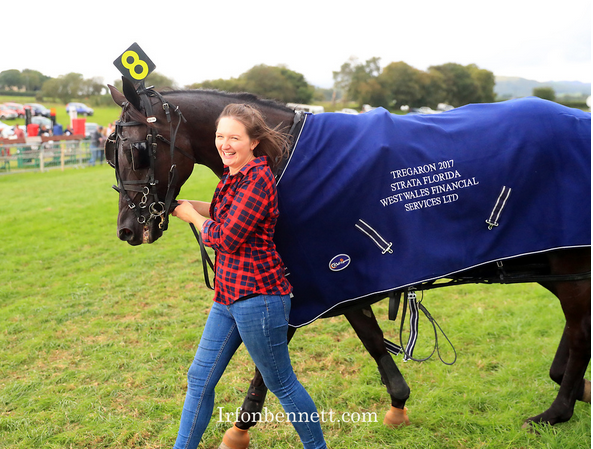 Tregaron Festival 2017 has already been covered on Harnesslink - read here - and you could forgive writer Kayleigh Evans for being a bit less measured in her report than usual, although she writes as professionally as ever. The reason being, for those of you not familiar with Michael and Kayleigh, that for the last number of years Michael has been training horses from Kayleigh's family home in Penuwch, alongside Kayleigh's brother Mike [Evans]. 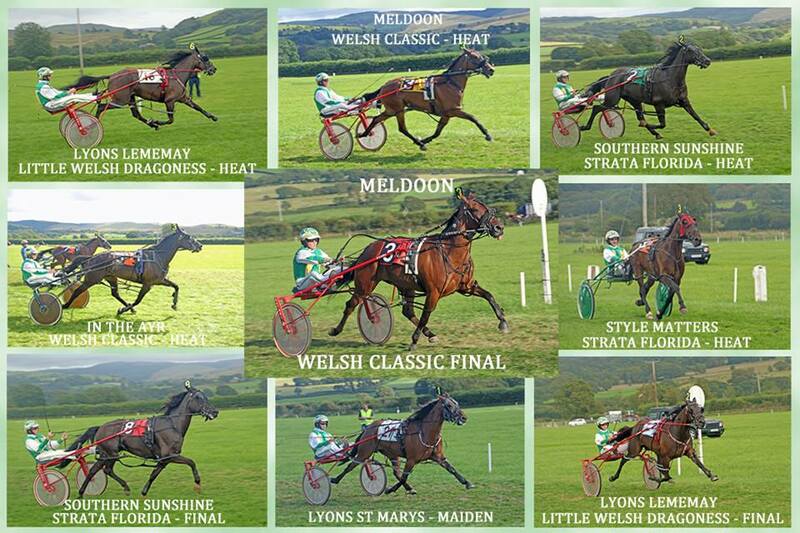 I think we'd all forgive a bit of bias in a report which means so much to the writer (who shed more than a few tears after Meldoon won the Welsh Classic Final! ), so well done Kayleigh for the utmost professionalism in print! As I go to print with this myself, 4 weeks have passed since the Tregaron Festival. My timing is getting increasingly worse. Once the subsequent weeks' updates have been posted you may begin to understand this tardiness. 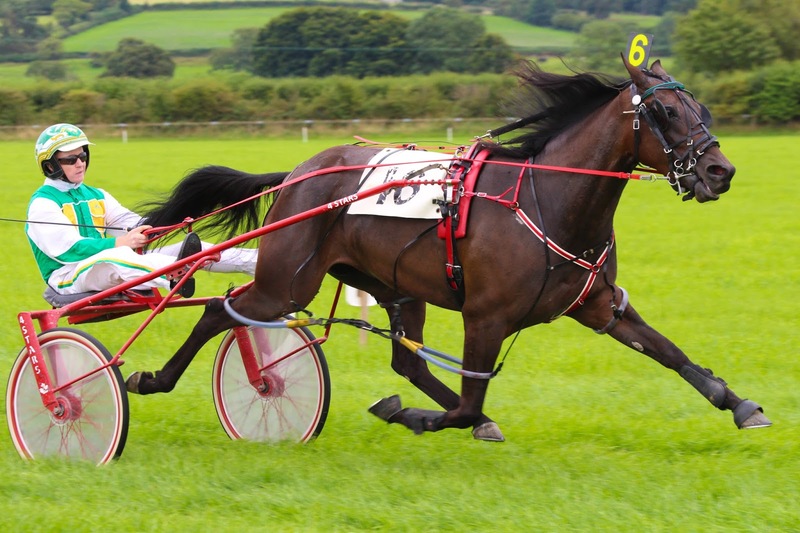 In a reflection of the month of August for harness racing, I have been overrun with projects, trips and in recent weeks, preparing sales adverts for both York and Builth sales. This time of year is hard, albeit enjoyable, work. Anyway, we shall delve in to some of the highlights from Wales' premier meeting which, this year, was back on par with some of the previously more enjoyable stagings and one which you would have regretted to miss. 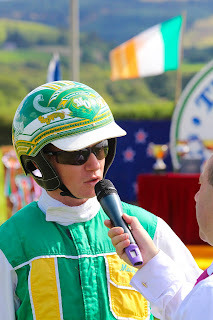 Let's begin with the NINE winners piloted by 'man of the moment' (or, indeed, 'man of the weekend'), Michael O'Mahony. 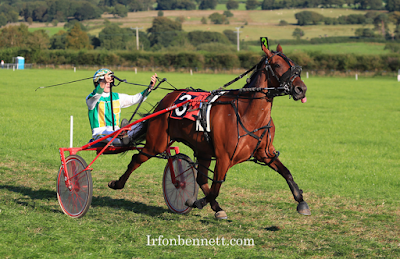 First up was the first heat of the Little Welsh Dragoness, in which he drove the Geoffrey Lyons-Mound owned Lyons Lememay (1/9), winner of the Oakwood Stud 3YO Fillies Oaks at the VDM weekend. This filly joined Michael's stable mid-season and has come on leaps and bounds under his care, going on to win the Little Welsh Dragoness Final later that day (2/9). 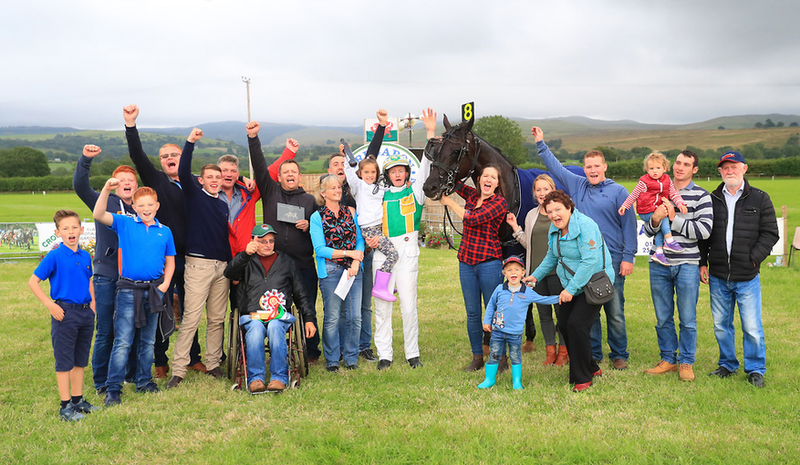 Michael then went on to win the first of the five Strata Florida heats with Style Matters (3/9), owned and trained by Lowri Jones. He was unable to take the drive in the final after steering Southern Sunshine to victory in the last of the heats (4/9) with a well-timed late run in the stretch and it was the Irish-owned horse which came home in front in the final (5/9) with a mirror image drive from the man with the most laid back driving style on the British Isles. 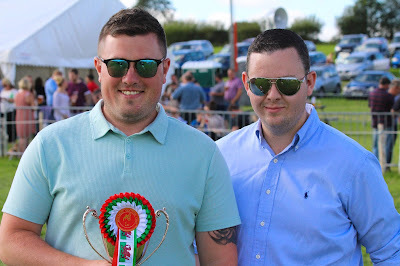 On the Saturday, Michael gave little away in the Facebook Live interview with Darren before the racing, but it wasn't long before he was back in the winner's circle in the first of the five heats of the Welsh Classic. This time it was with the Bethan Kelly-owned and trained mare, In The Ayr (6/9), which he guided over the line in front, with a whole host of ladies piling in to the centre of the track for the winning celebrations after the race. 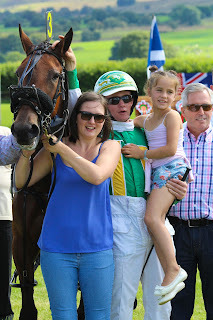 Michael was straight back into the winner's circle in the next race, again with a mare, this time in the shape of Meldoon (7/9) who looked impressive when finishing second to Rhyds Passion in the STAGBI Future Broodmares race at Tir Prince a week earlier. It was the Roy Roberts-owned mare which he later chose to partner in the final. Before heading to the final, Michael made another detour via the winner's circle with another Geoffrey Lyons-Mound 3YO filly, Lyons Saint Marys (8/9), the heavily backed favourite in the second of two maiden races on the Saturday. As if the tally marks after each winner weren't enough of a giveaway, and in order to truly be the 'man of the weekend', you should have come to the very obvious conclusion that Michael topped off a phenomenal weekend with victory in the Group 1 Welsh Classic Final when romping to victory on Meldoon, the four-year-old daughter of Doonbeg out of Real Melody. 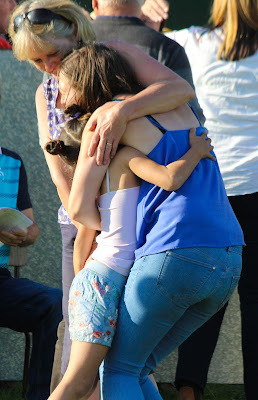 Emotions were very high immediately following the race, and despite trying my best not to succumb to the tears, when I looked at fellow STAGBI director Gwenan (who is heavily involved with the staging of the fixture at Tregaron) and saw her crying without abandon, I went over the edge! Then Kayleigh appeared on the track, in tears, with her mother, and also Michael's number one fan, his niece Chloe Anne who was such a delight over the course of the entire weekend and seemed to love every minute of Michael's success. Michael's family soon joined the party in the winner's circle, followed by Meldoon's deservedly emotional owner, Roy, his wife Diane and friends. There are moments in racing when I look around me at the way in which winning affects people and I think 'this is the drug we all crave'. That high of victory is what we all chase after every time we put our horses onto the race track. I love the feats that horses achieve and the manner in which they do it, and I love the emotions that people show when the horses they care so much about fulfil their potential. Roy was unashamedly emotional about the victory and nobody could blame him; owning a Welsh Classic Final winner is one thing but to have bred her as well, that's just wonderful. Delving back into the general racing, I must mention the spectacular drive that Steve Lees gave No Brakes in the Little Welsh Dragon 3YO Final on the Friday. Regular driver Grant had qualified the horse in the last available place in his heat; as a fourth place qualifier he was left with a choice of the two worst picks for the draw and as such, Grant made the decision to drive Tarawood CJ (drawn 2) who, having won his heat with Grant at the reins, was entitled to second choice after the other heat winner, All Good Hanover (drawn 1). I was a little surprised to see Grant choose a horse he'd only driven once over a horse he has driven (with much success) all season, however all's fair in love and racing and based on their heat performances, CJ looked to have the better chance in the final. CJ looked to have an even better chance as the race went off when All Good Hanover broke at the start, massively impeding the horse drawn behind it, GDs Hazzard. The starter allowed the race to continue without calling a false start, which in hindsight would have been the correct decision. Starter Shae Price has taken a lot of stick (borderline abuse) for the decision, and I am going on record as saying it was the wrong decision to make in not calling a false start. However, people make mistakes. It's very easy for me to sit here and say all of this with a level head; I've been known to lose my rag at the starter at Corbiewood in the past when it's been my horse which has been impeded by a breaking horse in front of it at the start, only for the race to go ahead and my horse to be tailed off. Impartiality is a wonderful thing. To the connections of the two horses involved: nothing could be changed once the race was over. 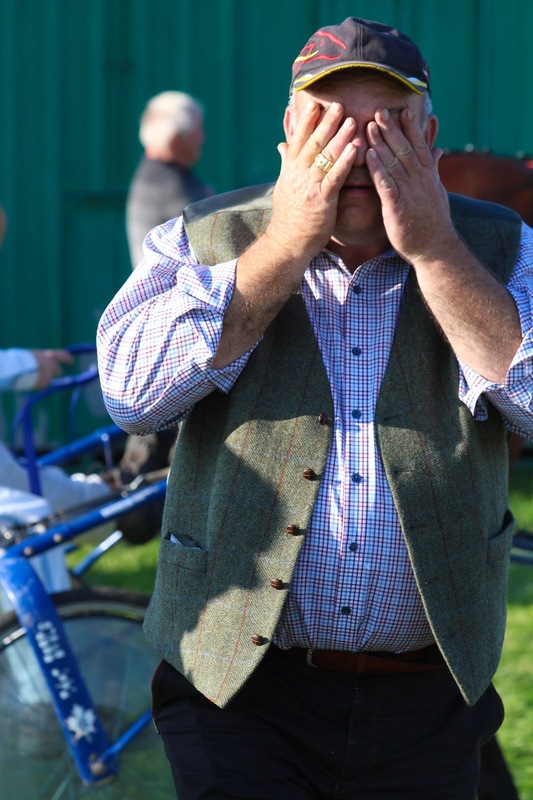 To the Thomson's, I feel for you as your horse was innocent in the whole debacle and was never given a fair chance, and despite being impeded ran a stormer to finish fourth, only losing out on a rosette by a nose. To driver Lee Fletcher on board All Good Hanover - if what you have said is true, that the reason you had your horse turned back into the stretch after pulling up whilst the race was still going was because you were going to send it hell for leather towards the field and bail out and see what damage the horse could do - shame on you. I sincerely hope this was a bad joke and that despite the red mist which I'm sure many of us suffer from, you are able to accept that your horse was in the wrong; had you galloped on the second line and not hampered anybody, you'd have been left, fairly and squarely. Whilst I don't particularly want to give the former Bishop Auckland Soccer Hooligans co-leader a stern telling off, here I find myself. Let's put this all behind us and move on; the starter made a mistake, he has learnt from it, calling for him to never start a race again simply adds more pressure on the BHRC to find volunteers for thankless tasks. Remember that. I don't see an orderly queue forming to take on the job. Back to the race itself: I was partaking of an alcoholic beverage with my friend, Hayley Cassells, who happens to be the groom to No Brakes (aka Charlie). 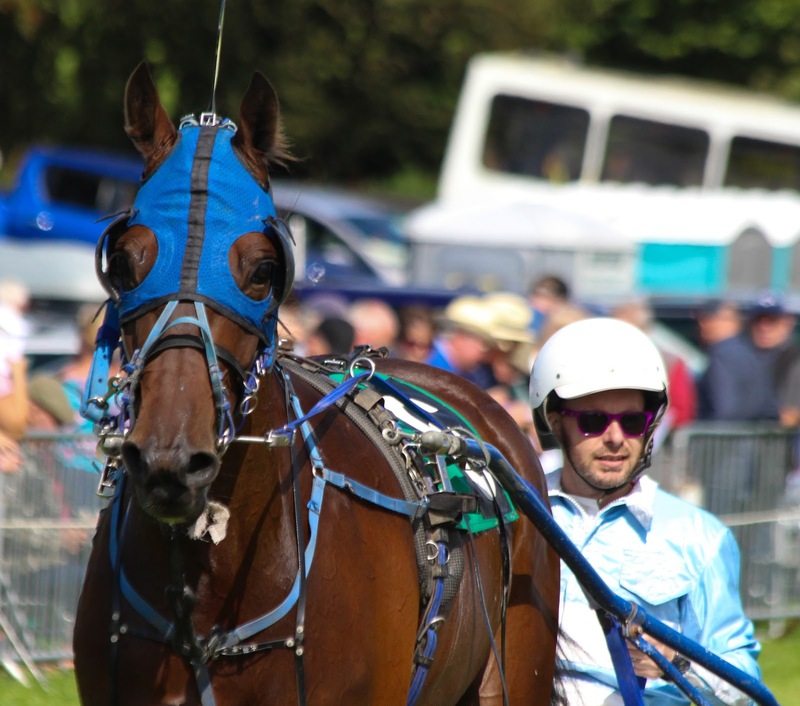 Below par earlier performance in his heat, bad draw in the final and the fact that Hayley couldn't see over the crowd in front of her to watch the race meant that the two of us were basically having a bit of a blether in the background and not really paying attention. At the business end of things I saw Alan Jones coming wide with My Buddy down the stretch and got all excited because I love underdog-type scenarious and major upsets in big races and all of a sudden No Brakes is storming through the centre of the field to get up by three quarters of a length. I turned to Hayley, who had a full pint in her hand, and screamed 'CHARLIE HAS WON' and for the first time in the 3 years I've known her, Hayley threw her pint in the bin. In the bin. Just lobbed it like it didn't matter and ran for the track. And I followed, because that seemed like a good idea. Anyway, a massive CONGRATULATIONS to owners Bob and Linda on their win. Linda's delight every time Charlie has picked up a rosette this season has been great. The proud Facebook posts and the photos of his trophies and ribbons have been refreshing to follow. Charlie's done good! 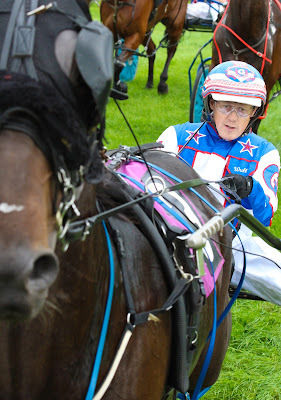 To round off my recap from the first day, a mention must also go to Horse of the Year contender Evenwood Sonofagun who was commanding in his FFA appearance when winning the Battle of the Big Guns in an impressive time of 2:04. This was his 14th consecutive win and his 10th of the season. He's phenomenal and a joy to watch racing. 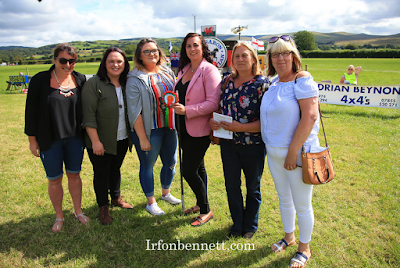 The second day featured a few performances that I enjoyed, including Rhyds Adora (Dai Isaac) winning the first race of the day, a maiden race. The runner up, Ayr Musketeer was also an eye catcher and subsequently went on to win his maiden at Lampeter. Oaks Telstar won his novice by a head from Blackfield Jennie, and while I rate him a far better horse than that performance, he was decidely lacklustre and this turned out to be his final race of the season. He will start the 2018 season as a Grade 1 and I think he's shown plenty of potential this season already to make him a really chancy candidate for one of the major grass handicap finals next year. In scenes the stewards deemed reminiscent of Rhun Wilson's training 1-2, Alexis Laidler fielded the first two home in the third of the five heats of the Welsh Classic. This time William Greenhorn was on the runner up, JMs Hallstar, while Rocker drove Jack Swagger to victory. Willie was called in to the stewards after the race and was subsequently find £50 under rule M28 (In the event a drive is unsatisfactory due to lack of effort or carelessness, and the Stewards believe that there is no fraud, gross carelessness, or a deliberate inconsistent drive they may impose a penalty under this sub-section including, but not limited to, a fine and/or suspension or disqualification). A lot of people were talking about the drive; I didn't see it on the day as due to the angle I was standing at I only had a head-on view down the stretch. However, the racing was recorded for the Welsh language harness racing show, Rasus, and the race was (possibly poorly chosen) aired on the pre-recorded show. The footage used showed, in my opinion at least (although as I'm not a driver I'm not actually supposed to comment on how others drive), a pretty bad example of not driving a horse on its merits (aka 'non-trying'). The penalty for a breach of this rule is 'Fine and/or suspension'. Now, I'm currently working on another post/an open letter to the BHRC Council about removing the discretionary element of the majority of penalties in order to create a level playing field AND give stewards some added protection from often unfair verbal/written abuse (a case of 'don't hate the player, hate the game'). So we'll leave that for another day. My point here is, whether we agree with the amount of the fine or not, the driver was fined. 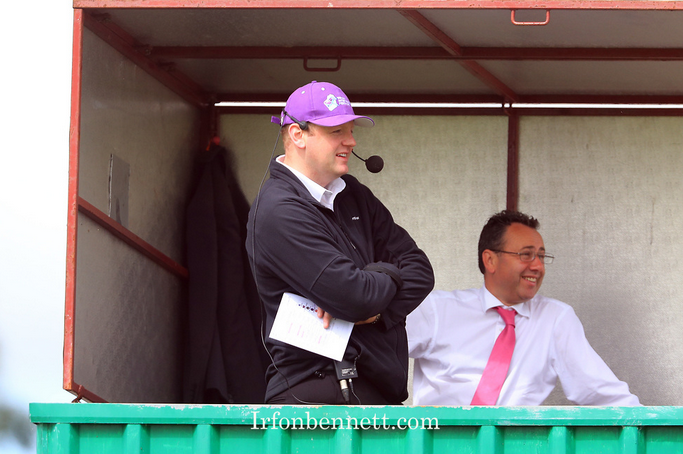 I now hear a rumour (courtesy of Watty & Fletch on TrotTalk TV) that Willie has been called back before the BHRC Council for a hearing relating to this incident. Whilst I fully agree with the BHRC as a governing body reviewing the decisions of stewards, in this instance I am unaware that anybody has appealed the decision. The rule breach was identified and penalised as per the rulebook. The BHRC seek now only to undermine the track stewards who imposed the (arguably too small) fine. Regardless of the amount, the fine was still imposed. The BHRC should perhaps instead seek to review the rulebook and penalties rather than retrospectively looking to punish a driver for an offence he has already been punished for. Double jeopardy, as those familiar with the criminal justice system refer to it. The man did the crime, now he's done the time, so to speak. Let's all move on. Sadly, the horse involved in the incident, JMs Hallstar, has since been put down, and is a great loss to the team as he still displayed bags of potential for the future. The owners were keen to locate another horse with potential for the 2018 season, and later that day a horse from the stable must have caught their eye when winning the Grade 1, as Easy Company (owned by Gregor Paterson and Scott Mason - the gruesome twosome) has since been purchased by the Huschkas. Good luck and well done to connections, new and old. 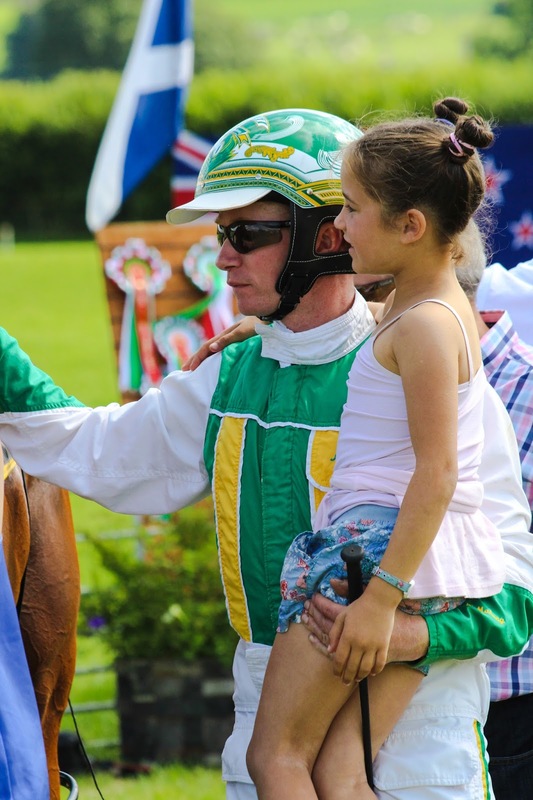 Sticking with the Huschka/Laidler combination, their 2YO colt Merrington Movinup surprised many, but not all, when overturning stable mate and betting favourite (actually, unbettable favourite) Matticulous to win the Junior Welsh Dragon. 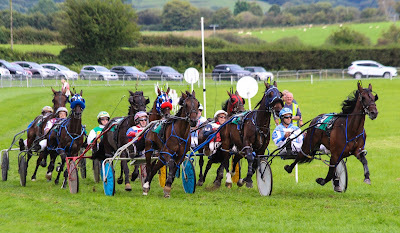 Some connections of the runner up were overheard stating their unhappiness with the way the horse was driven, but the draw was what made the crucial difference in this race, and the winner should never be underestimated. 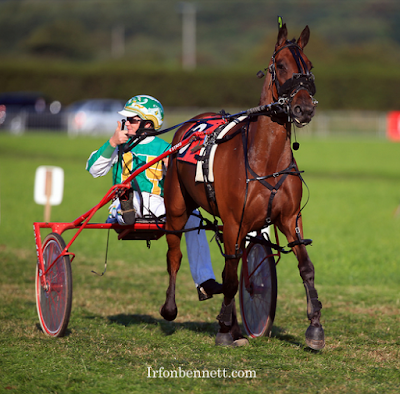 He was a very impressive winner in 2:07 (bearing in mind that the Junior Welsh Dragoness winner, Greenhill Hanover, clocked 2:13.4 in the previous race). My final observation of the weekend relates to a horse I am from now on referring to as 'The Iron Horse': Llwyns Delight. And what a delight he is for owners Lee and Robyn Price and both their families. He is such a family favourite and indeed a favourite with harness racing fans. Having won the Tregaron Spring Handicap heat and final in May, he also went on to win heat and final at one of the country's fairest and toughest tracks - Boughrood, just 6 days before winning a heat of the Welsh Classic at Tregaron. 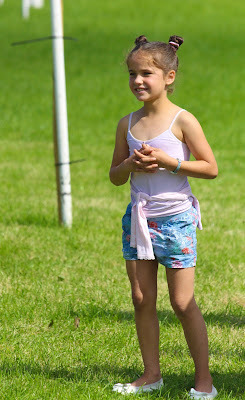 He then finished third in the final off a whopping 50 yard trail with a tremendous late run to prove his staying power. 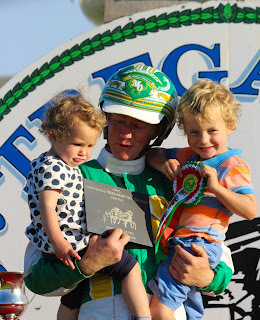 From 19 starts this year, winner of 6 with 6 placings, all in good company. What a superstar he is! And there we have it. A very belated review of Tregaron. I am aware that I haven't touched upon all of the races, winners, incidents and news from the meeting, but as time goes on my memory begins to fail me and at meetings as big as this, I can only really process and retain so much information. For two whole days I find myself taking in so much, both on and off the track, that when I finally get home to Scotland I need about 3 days to recover! It's meetings such as this, and Appleby, Musselburgh and Aberystwyth, that so many of us train horses for - we want to win here. I may not have mentioned every winner individually, but to those of you who won - WELL DONE. It is a lot harder than many appreciate, and winning at Tregaron remains at the top of most people's bucket lists. Rightly so. 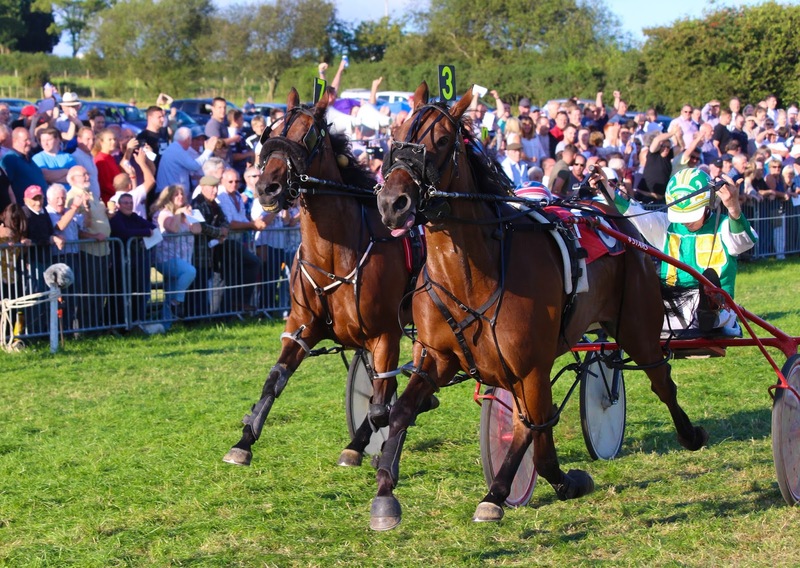 Well done to all of the people involved with Tregaron Trotting Club - you smashed it! Double jeopardy law was abolished in uk law in 2005. If that race had been live on tv or in the betting shops there would have been uproar.